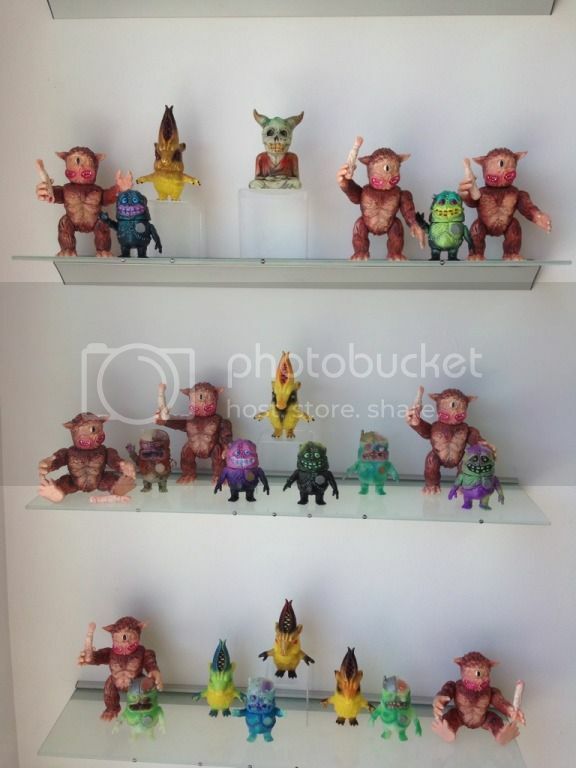 The first Japanese sofubi I got into collecting was Secret Base fight figures. One of the things I loved about them (aside from the visual aesthetic) was the back stories behind the characters. It gave them context and personality. It made them more real to me. Of course the translation factor going from Japanese to English is always humorous but the ability to place the characters into different scenarios in my mind as I looked at them made them more than just a small vinyl toy. To this day, I can still look at them at any time, all lined up on their respective shelves and immediately be brought back to my childhood playing with my Star Wars action figures out in the woods behind my house. That is why it is important to me to always have that same context behind all of the toys I make. As new characters emerge I will revisit this thread and update it with their stories. So far there are 3 to tell but one new one is in the works as I type this out and hopefully many, many more will follow after that. Enjoy and keep checking back! A long time ago, the King of Alavi went hunting and was captured by Alavaka. Alavaka lived near the city of Alavi and feasted on human flesh. He was a vile being that was fierce, powerful and crafty who was known to all as “the demon”. The king begged to be released, but in return for his freedom the demon made him promise that he had to send a person to him every day as an offering. The king quickly agreed, afraid for his own life, and fled back home to his palace. From that day forward, a prisoner was sent from the palace dungeons into the forest with a plate of rice. The prisoner was told that to gain his freedom he had to go to a certain tree, leave the plate and then he was free to do as he pleased. It should come as no surprise that soon the prison became empty. Once again the king became afraid for his own life and thought that Alavaka may seek him out if the offerings ceased. His ministers advised him to leave bits of gold in the streets. Those found picking up the gold would be labelled as thieves and were imprisoned. Soon the palace dungeon was filled once again. The residents quickly caught on to the trick and soon the gold was left untouched. The king began to panic and sent an order to his guard. They started abducting children who were playing in the streets to send for the offering. It wasn’t long before all of the families of the city began to flee, leaving it deserted and the king completely desperate. There was only a single child left - and he was the king’s own son. Hysterical with fear and reluctance, the king ordered that the prince be sent to Alavaka the following morning. An so it was that the Buddha happened to be near the city that day. As he surveyed the world with his Divine Eye he foresaw what was going to happen. Out of compassion for the king, the prince and Alavaka, the Buddha travelled to the demon’s cave. 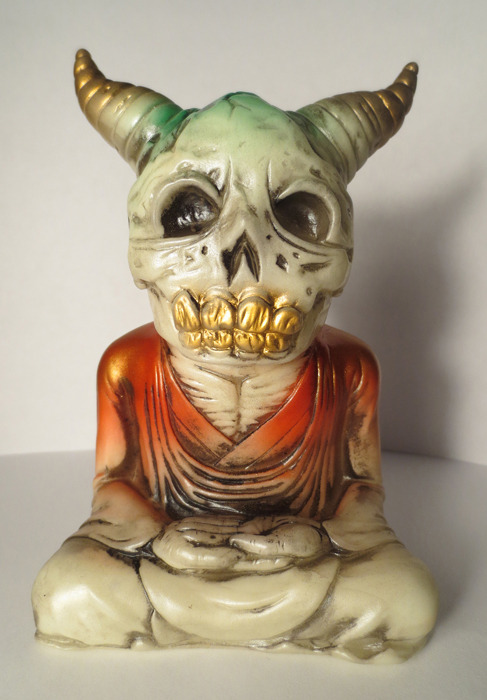 The demon was away and the Buddha was stopped outside the cave by a gatekeeper. The Buddha said he would wait for Alavaka to return so they could speak and the gatekeeper quickly left to inform his master of the visitor. The Buddha went into the cave and sat with the demon’s wives. He began to speak of the Dharma to the women. As if shocked by a bolt of lightning, Alavaka dropped to the ground with the clear understanding to the meaning of the Buddha’s words. Alavaka then said, “Now I know what is the secret of my future welfare. It is for my own welfare and good that the Buddha came to Alavi.” Alavaka prostrated before the Buddha and begged to be accepted as a disciple. At sunrise, when the officers of Alavi came with the king’s young son, they were surprised at the sight of the Buddha preaching to Alavaka, who was listening attentively to his words. When the boy was handed to Alavaka, he grew ashamed of what he had been and covered his face. After a moments pause, he stroked the boy on the head, kissed him and handed him back to the officers. It was then that the Buddha blessed the child and Alavaka. Kasyapa was a man who aided the prosperity of the area he lived by utilizing his power to control the weather. He did so by summoning and controlling evil dragons capable of bringing storms and rain. In an effort to keep these dragons at bay, the local villagers offered Kasyapa grains and food. Over time, the villagers became lazy and comfortable and started to forget their offerings. Kasyapa grew very angry. In a fit of rage, he prayed that he himself would become a dragon, so that he could properly unleash his anger and punish them for their lackadaisical attitude. His prayers were soon answered. One night in the middle of an intense thunderstorm, he passed away and was born again as the dragon Apalala. He made his home in a clear blue pond in Udhyana. With seething vengeance, he led his army of dragons and destroyed the surrounding villages with fierce storms and treacherous rain. The villagers offerings to Apalala returned tenfold. One day Shakyamuni Buddha passed through the land. The two met at the edge of his Udhyanian pond as the Buddha stopped to drink. Apalala said, “greetings fair traveler, what do you have to offer in exchange for the gift of water I give to you”? “The gift is not yours to give but one we all receive from the rain and the seas” replied the Buddha. “A clever answer but can that answer resolve this” and Apalala rose from the pond. Winds whipped, lightning flashed and a storm cracked the sky. The rain pounded and the land all around the pond began to flood. As the water rose Buddha smiled at Apalala. He did not move yet the water never rose higher than his neck. He spoke to Apalala, “There is no true peace in ruling by fear and anger. No matter how intense you make this storm it can not extinguish the truth that burns inside me.” The Buddha brought his hands out of the water as fists at either side of his head. “That truth is...in life there is suffering, there is a cause to this suffering, suffering will diminish when we pry open it’s grasp and we all have the power to release it’s hold on us.” With that the Buddha opened his fists and brought his palms together in front of his smiling face. Apalala froze as the Buddha’s final words left his lips. The storm ceased and he fell to his knees. His scales fell away from his body just as a snake sheds its skin. The Buddha placed his hands on Apalala’s head and asked him to rise. He reached into his pack and pulled out a small bell on a string and hung it around Apalala’s neck. “When in doubt of the truth, simply listen. With right concentration it will always ring true.” They came to an agreement where Apalala would stop his destruction in return for one crop every twelve years. Rather than relying on the people to provide the offering, he would take it himself by flooding the land and leaving the villagers unharmed, thus eliminating his terror filled reign. It has been told in ancient Japan that the souls of children who die prematurely are sent to the underworld as punishment for causing great sorrow to their parents. They reside at Sai no Kawara, the river of souls in purgatory, where they pray for Buddha's compassion while building small stone towers that signify the weight of their loss on their parents. But underworld demons, answering to the command of the old hag Shozuka no Baba, surprise the children each day, scatter their stone towers and beat them mercilessly with iron clubs. It is the renegade Bodhisattva, Jizo-Anarcho who comes to their rescue by befriending the children and hiding them in the sleeves of his robe from the demons when they next arrive. Sir Trog and Nuggets303420 like this. Looking forward to more pics...and tracks! Ooooh, intrigue! Looking forward to seeing the rest of it Toby! My personal Holy Trinity is Papyrus, Comic Sans and Impact. In that order. Put 'em all together for maximum effect. Don't forget Sand. Thank goodness they stopped putting it on Macs. awesome! I want one of these! Nuggets303420, Alebrije and boon velvet like this. Wow, when are the preorders going up? The actual website only has a link back to the audio. Kind of hard to get a sense of scale or parts etc. Guess the cat jumped out of the bag. BOOM indeed. just to clarify for some people i worked with joe on this and had him do the sculpt for me but it is not a "splurtt" release it is mine. joe is a great guy who makes some awesome toys and i really appreciate all the efforts he put into this (especially dealing with all my chicken scratch sketches and crazy comments along the way... ) so thank you joe. Sorry Toby if you didn't want it revealed until the show opened. I didn't know TAG would use the image for promotion, the guys there must really like it. Anyway that is a one off for the show. But I saw a teaser for the first run on Toby's Instagram and it's looking very nice. Congratulations to Toby, very glad to have been involved, such a cool figure and unique pose. Sorry Toby if you didn't want it revealed until the show opened. I didn't know TAG would use the image for promotion, the guys there must really like it. We certainly do like it. I bought it. Would love to have you in an upcoming show at TAG. Damn you Connell! That was the only piece I wanted for myself. Oh well at least it didn't go to a flipper. That piece was even better in person. Hopefully there is a wider release and a GID. Never have too much GID, with gold teeth. Nuggets303420 and Purple Bat like this. I'm assuming a lot of pink releases, with pink. Connell was on this like a fly on...err vinyl. Couldn't have gone to a better home. Great design Toby, and fantastic sculpting as always Joe. I'm always amazed by the talent around here. Someone needs to buy the original, and excellent, pen and ink drawing of alavaka. Im diggin this toy a lot.it looks great,im interested to see one in person.i hope for a run of these guys in black glittery vinyl one day.the one off from the show was killer!on a side note i just checked the site and couldnt believe the gem i found of all the old acacia strain 3750 merch holy awesome! note to international buyers, i pack and ship direct from home (priority and priority international) and i will not ship cheaper/other services that are not trackable because of previous experiences. presently my store only allows for a flat rate shipping fee for orders and it does not calculate to your address. for those of you outside the usa who may be interested in ordering a figure i will charge you actual for priority international shipping to you so if it is less than the flat shipping at checkout i will issue a partial refund after shipping but you will be charged worst case scenario shipping up front ($35). i apologize in advance but it is the best i can do right now under the circumstances of the way the shop is set up.